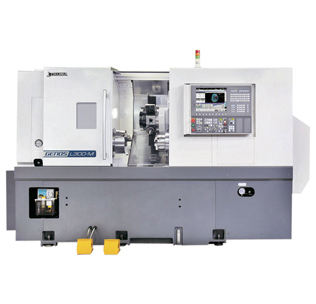 The GENOS L300 CNC horizontal lathe offers the broadest range of configurations in the GENOS lathe line - affordable, entry-level, multi-function lathes that are anything but basic. Built on a one-piece, cast iron base with a horizontal way system and hand-scraped headstock and tailstock mounting surfaces, this machine provides stability, rigidity and accuracy for a variety of applications. Standard 10" chuck and live tooling, the machine can be configured with Y-axis and/or sub-spindle and is available with 5 different Z-axis travel lengths. Affordability meets flexibility. Looking to Purchase a New OKUMA GENOS L300-M? Looking for a USED GENOS L300-M?Have one to sell?